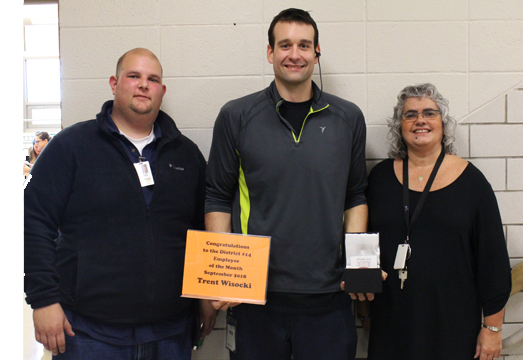 Fridley Public Schools September Employee of the Month is Trent Wisocki, custodian at the Fridley Community Center (FCC). Trent, who has been working for the district since January 2018, goes above and beyond to make the FCC a great place to work for staff and a welcoming environment for community members, families and children. According to Director of Community Education Toni Craft, Trent is a fantastic coworker who has incredible mental organization and who always takes pride in his work. Craft added that Trent played an integral role during construction at the FCC this summer. He brings many skills to his job, which has saved the district money for not having to outsource tasks. Buildings and Grounds Coordinator Alex Winn added that Trent works hard to ensure that the FCC operates smoothly. “He is always making the FCC an inviting place for students, staff, and the community,” said Winn. Congratulations, Trent, and keep up the great work!